Social interactions with peers, self-help skills, letter and sound recognition, rhyming, writing of names as well as other letters and numerals, numeral recognition and adding and subtracting with manipulatives are some of the many things that the children in the Ladybug Room are working on. The Ladybug Room was designed to provide exceptional care for children aged four to five years. Enrolled families can expect a safe, secure, nurturing, and age-appropriate learning environment. Experienced, well-qualified teachers are staffed at a 1:12 ratio. Teachers are dedicated to responding promptly to every child’s daily needs. 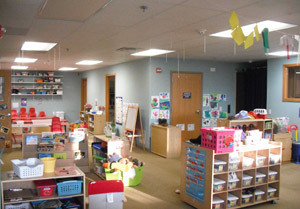 The Ladybug Room has a generous parent area which displays weekly lesson plans, upcoming events, classroom volunteer sign up, as well as a glance at each particular day’s activities. In addition to communication at drop off and pick up, families are encouraged to call or visit as desired. Ladybugs continue to practice consistency by following a daily routine. Teachers foster growth by introducing new experiences through creative play and exploration while encouraging children to learn. Kim Boyd, co-lead in the Ladybug Room, has been working at HWGLC since November of 2015. She is thrilled to be able to bring her knowledge, motivation, enthusiasm and creativity to the children she teaches. Kim received her Bachelor’s Degree in Education and Spanish at Monmouth College. After college Kim was a nanny for four children under the age of five and absolutely fell in love with it. She has experience with all ages, babies to middle school. Kim is originally from the Chicago land area, but is really enjoying Madison and what it has to offer. In her free time, she enjoys reading, crafting/sewing, and watching movies.